Elia Arce missioned me in April 2010 to curate a Latino exhibit. I selected a group of uprooted and acclimating emerging artists to engage in dialogues with selected established curators, critics and artists, Surpik Angelini, Elia Arce, Margarita Cabrera, Aisen Chacin, Ruben Cordova, and Delilah Montoya. The work for the exhibition was created from these dialogues that both subversively and romantically embrace Latin classification as a point of departure to investigate historical and current geography. At the core of these dialogues lies the need to move beyond traditional categories of Latin American and Latino Art and to frame new definitions, visual languages and creative practices among these artists in Houston. La Lengua Muerta yielded visual and performance works to be as diverse (inform, subject, aesthetics, and influences) as being Latino. Daniel Adame, Chuy Benitez, Aisen Caro Chacin, Claudia Cruz,Tito-Fabian, Sebastian Forray, Jonatan Lopez, Angel Quesada, Stephanie Saint Sanchez, Alex Soares. 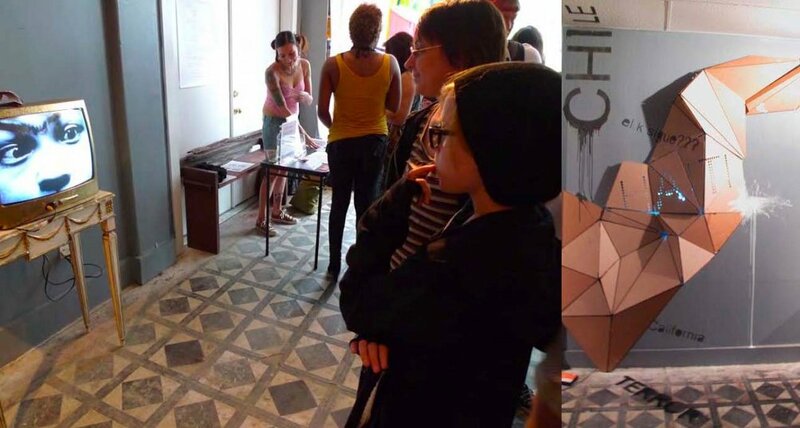 Installation for La Lengua Muerta, paint 2010. 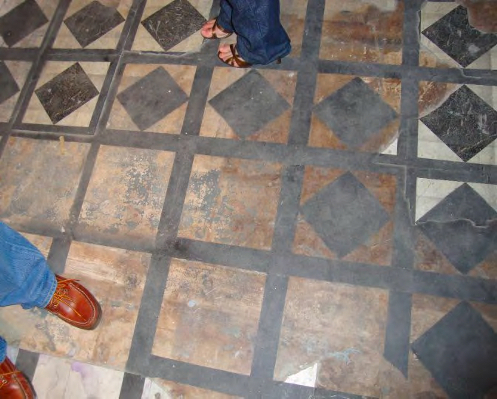 It began with wanting to fix the deteriorated floor of labotanica. I wanted to preserve its history, yet add another layer. The boundaries between the linoleums and the barren concrete reminded me of the territorial divisions recorded in maps. In constant flux, the frontiers of this crumbling linoleum are a record of their migrations of people, who, in their wanderings, have unwittingly changed the lines. I decided to homogenize the identity of the floor by assimilating the pattern of the dominant (and most recent) linoleum tiles. 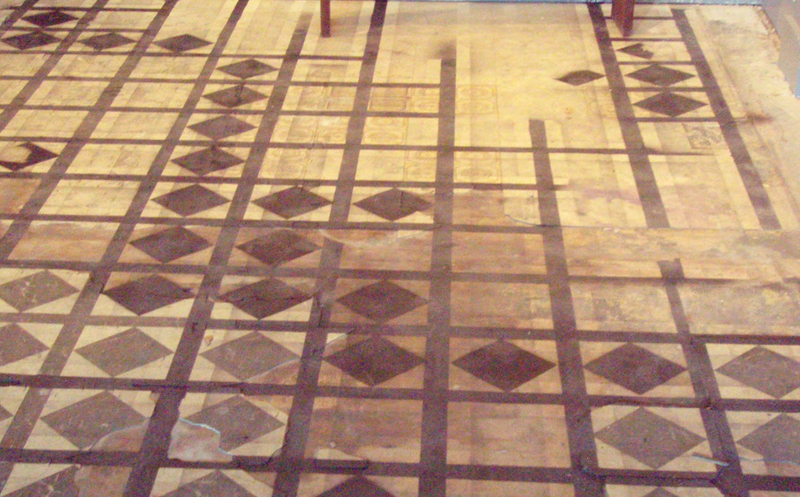 I recreated and stretched this identity over the piso (floor) mestizo with painted lines over the other layers creating a subtle illusion of continuity. It marked alien territory as its own, but it didn't erase its history. Then it became about conquering space and territory.